My new leopard print cardigan from Target! It was in their clearance section and I grabbed it when Cartwheel had their 20% off clearance deal, so I scored it for about $9! I've already worn it 4 times, so I think the cost-per-wear will be pretty low for this number! I have been reading like crazy lately! My goal for 2015 originally was to read 25 books, but I'm already on my 5th book of the year, so I upped it to 30 (and I'll probably raise it again). 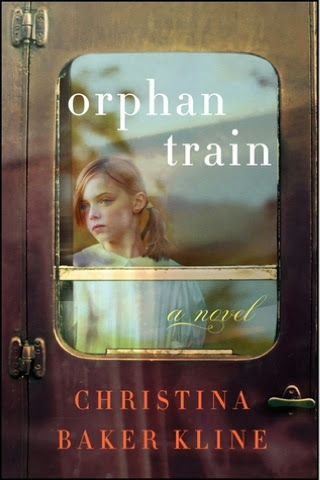 Currently, I'm reading "We Bought A Zoo" (which so far isn't really like the movie) and I have two books on hold at the library, "Orphan Train" and "One More Thing." Um, I just ate a mini bag of skittles? haha I will be having some leftovers for lunch soon of pesto chicken, roasted sweet potatoes, and green beans. Yum! Hmm, I don't think there's specifically anything I'm anticipating. I am excited for Valentine's Day because we are going to dinner at PF Changs! Yummm :) Hopefully we can actually make it out this year! Last year I got a terrible migraine and was in bed all day :( Not the most fun V-Day we've ever had, but it is what it is! I absolutely love that sweater and who doesn't love a steal at Target! Good job! That cute leopard sweater is a great find! 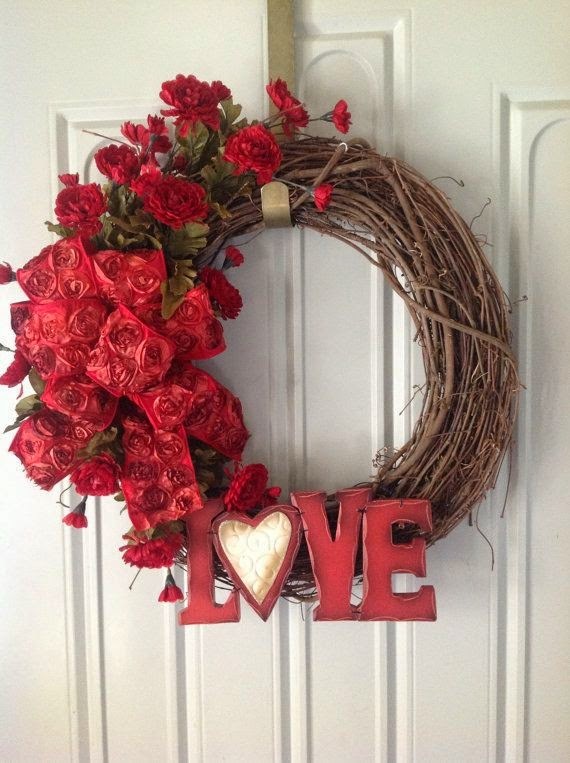 I'm obsessed with making wreaths and love the one you made for Valentines Day! $9?! Nice!! I really like it with the purple top! Thanks Kate :) I'm really happy with how they work together too! Thanks Anne! 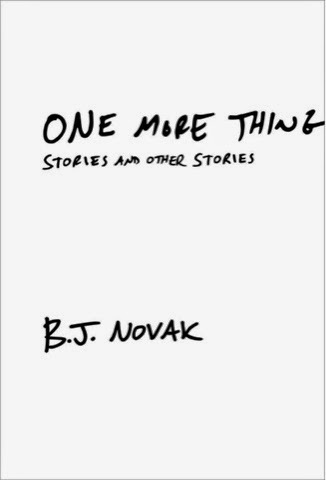 I'm about 70 pages in so far. I know a book is good when I don't want to put it down and can read through it pretty fast! What a fun post! 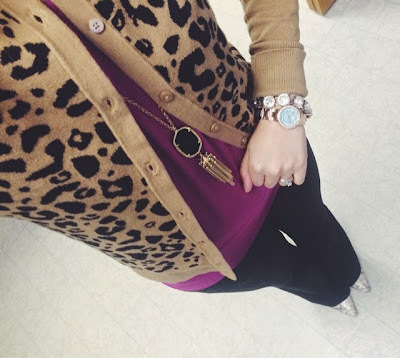 Love the leopard cardigan and great job on the Pinterest success. I hope you have a much better Valentine's Day this year - migraines are the worst! Umm all the YES to leopard sweaters and PF Changs! Hope Valentine's Day is 100% better for you this year!! Thanks Rachel! I think I'm going to wear it again today :) Definitely an awesome find! 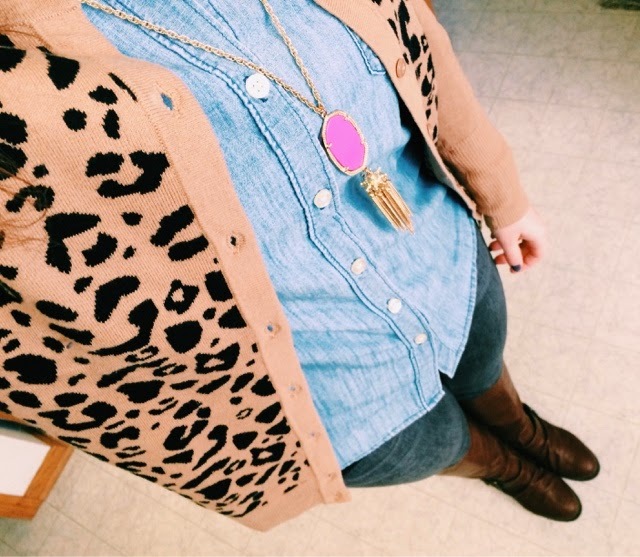 Lovvve that leopard cardigan! I also really love your outfits! So cute..and for only 9 bucks...YES! Thanks Jenna! Definitely a great score for a cardigan! What an awesome find on the cardigan. 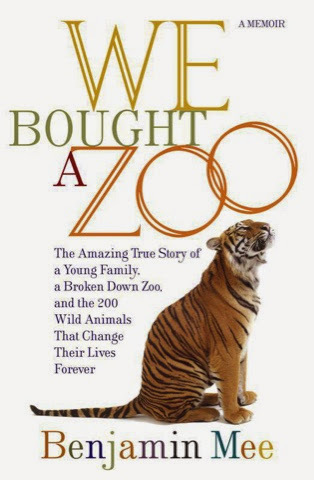 I'm also read more book the year to. I have so far only read the fault in are stars. That is on my list of books to read too! Ooooh what a great deal on the cardigan! It is so cute! And yay for PF Changs - I hope you have a great time! Thanks Ashley! It was definitely yummy :) Chinese food is my fav! 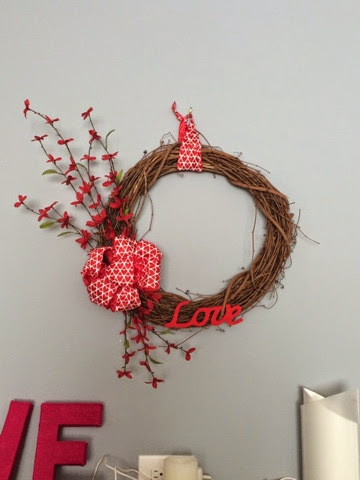 Beautiful leopard cardigan and red Valentine's wreath. And I am dying over some PF Changes. Enjoy your VDay weekend, Maria. Thanks Ada! I hope you had a good weekend too! I hope you are feeling good this Valentine's Day! I love your new cardigan! You've already worn it two cute ways! My mom bought me this cardigan on clearance too - I love it!! It's not a part of my capsule, so I haven't worn it yet, but I am SO excited to when I have the chance, haha! And I think I have all of those books on my "to read" shelf on Goodreads - can't wait to check them out at the library! Hopefully you'll love it as much as I do! I'm still wearing it all the time! Thanks Abby! I was surprised this was still in stock!